Last week, using weighted DVOA to look at the Wild Card Weekend matchups, the Colts had the best matchup and won on the road against the Texans but the Eagles had the worst matchup and upset the Bears in Chicago. DVOA is just one way at looking at the matchups and not a predictor of future outcomes. Football Outsiders DVOA is one of our favorite metrics to follow all season long. 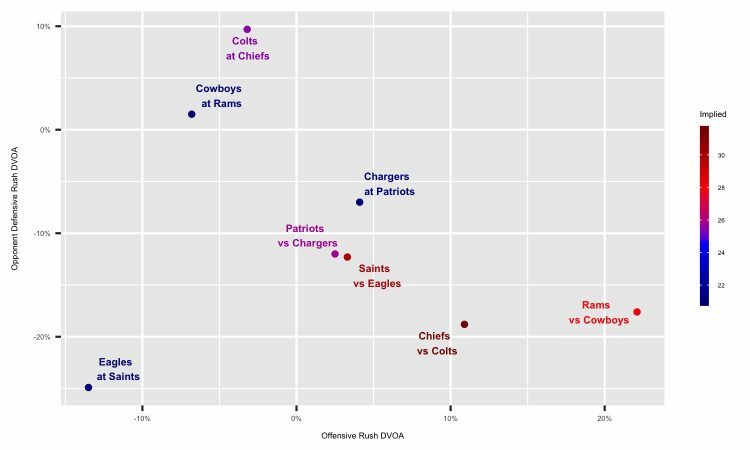 DVOA measures a team’s efficiency by comparing success on every single play to a league average based on situation and opponent. 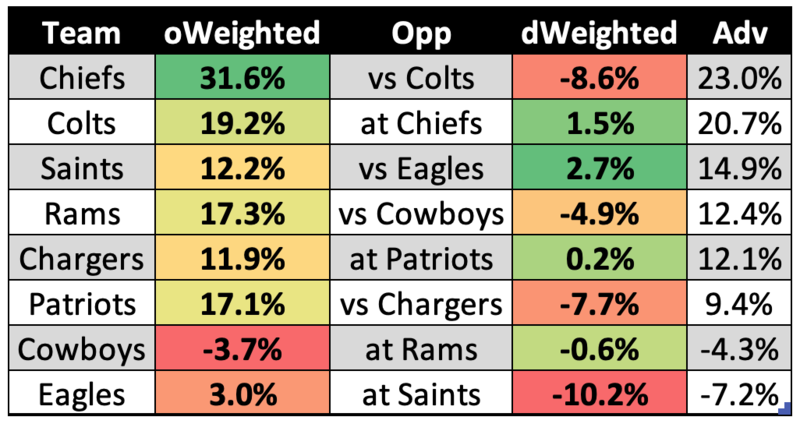 Their Weighted DVOA favors more recent games to give us a better idea of how teams played at the end of the season. Unfortunately, they do not have (or I can not find) Weighted DVOA for offensive/defensive pass/rush, just an overall Weighted Total DVOA. It is important to note that negative is good when it comes to defensive DVOA. 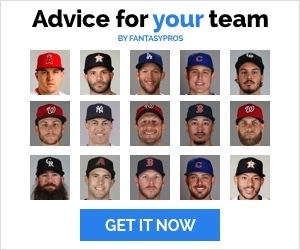 All tables below are sorted by offensive advantage. The NFL Playoffs are all about momentum and no team is hotter than the Indianapolis Colts right now. 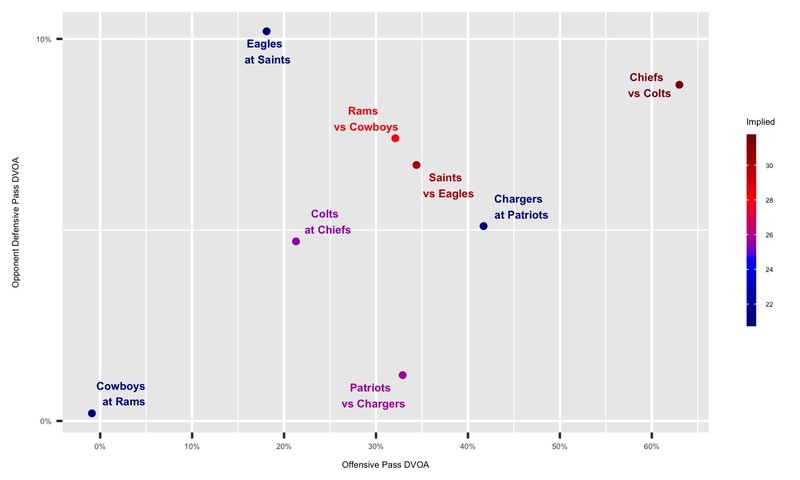 However, the Kansas City Chiefs offense finished the season nearly twice as efficient as the Colts. 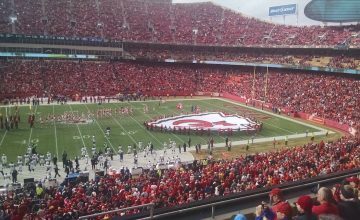 It is important to remember that the Chiefs defense plays so much better at home. 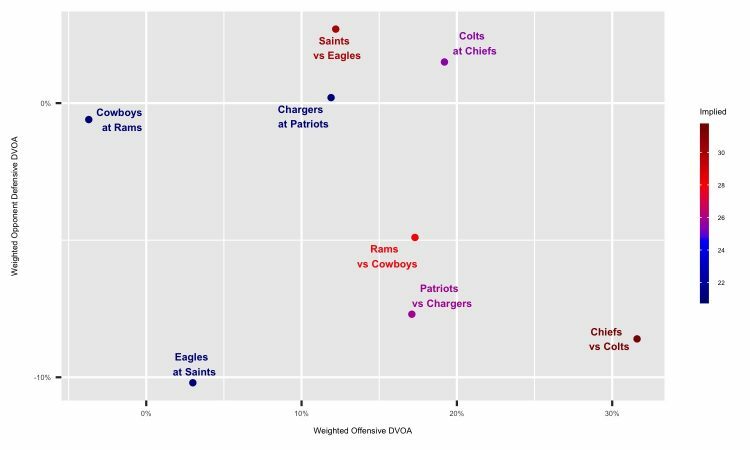 The New England Patriots and Los Angeles Chargers finished the season just about equal when it comes to weighted offensive DVOA. The Chargers defense is better than the Patriots but the game is being played in Foxborough. 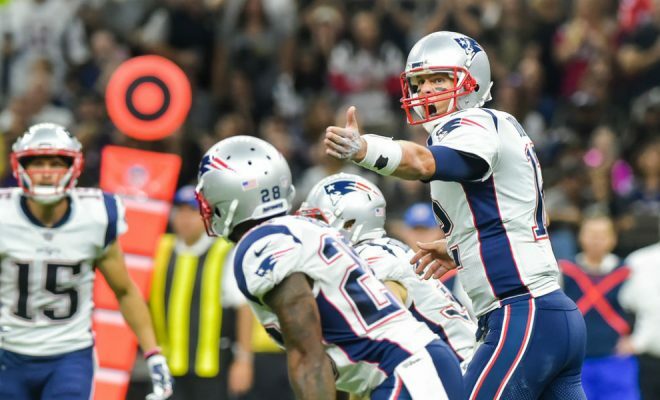 The Chargers are the leagues best road team but the Patriots were the only undefeated team at home in the NFL this season. This one is a toss up! New Orleans lucked out. Had Cody Parkey‘s kick gone through the uprights, instead of off it and the crossbar (it was also tipped), it would be the Dallas Cowboys coming to New Orleans. 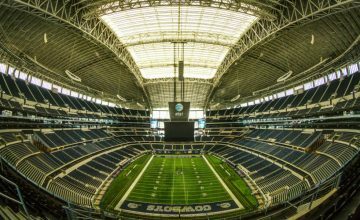 The Philadelphia Eagles defense is not as good as the Cowboys and Dallas already beat New Orleans, in Dallas, this year 13-10. Philly was in a tough situation last week against the Bears, at Soldier Field in Chicago, but Nick Foles found Golden Tate in the end zone for the game-winning touchdown. Now he has to continue his ridiculous playoff success at the Superdome, in New Orleans, against the Saints. Patrick Mahomes and Andrew Luck are about to provide us with one of the most entertaining playoff games in recent memory, aren’t they? We should be so lucky. Their combined 89 touchdown passes during the regular season are the most combined between two opposing playoff Qbs. Indianapolis struggles to cover opposing tight ends and is just average against WR1s. This is a great matchup for Travis Kelce and Tyreek Hill. The Colts don’t cover pass catching backs well and Damien Williams had 17 receptions and two receiving touchdowns in weeks 14-16. Kansas City is capable of shutting down opposing WR1s but this matchup is too juicy to avoid T.Y. Hilton at the right price and the Chiefs don’t defend the deep pass well. It’s a great matchup for Eric Ebron and the Colts RBs, if Luck decides to look to his running backs in the flat. Dontrelle Inman or Chester Rogers could blow up as the Chiefs don’t cover “other” WRs well. On top of that game, we get Tom Brady vs Philip Rivers with a chance to reach the AFC Championship Game. The Chargers defense shuts down opposing TEs better than any other defense in the NFL, so you might want to consider avoiding Rob Gronkowski. What they don’t do is cover WR1s and pass-catching backs well. Julian Edelman is not your typical WR1 but this could be a good week to roll with James White. But let’s be serious, this is the NFL Playoffs, it’s always a good week to play James White in the January/February. Nothing to worry about with Keenan Allen as the Patriots are just average when it comes to defending WR1s. They do a better job shutting down the opposing WR2 (Mike Williams) and rarely get beat by “other” WRs. Drew Brees, at home, in the Dome, in a playoff game. Philly was average against opposing WR1s so play Michael Thomas with confidence. They do not cover pass catching backs well either so expect Alvin Kamara to get involved in the aerial attack, per usual. Jared Goff‘s matchup with the Cowboys is a good one. As mentioned in last week’s Wild Card post, the Cowboys do a good job containing the opposing WRs, but they struggle against pass-catching running backs. Todd Gurley caught 59 passes and four receiving touchdowns this year. Brandin Cooks and Robert Woods will have to work hard to produce. Dallas doesn’t cover “other” WRs well according to Football Outsiders, so pivoting to Josh Reynolds could be a solid play in DFS this weekend. Dak Prescott continues to be an average starting caliber QB who helps his team win games with his legs. His ability to scramble led to six rushing touchdowns for the third year in a row and he added another one in the Wild Card game, after this first down run on third and 14. The Saints don’t defend the pass well and the Eagles will have to keep pace with Drew Brees. This isn’t a terrible spot for Alshon Jeffery or Golden Tate, despite his lack of production since being acquired. 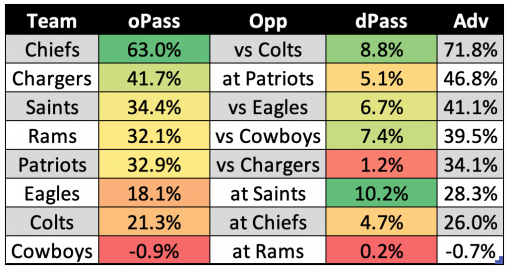 The Saints smoother opposing TEs so Zach Ertz is not the play this week, according to DVOA matchups. Marlon Mack is one of the hottest running backs in the NFL over the last month and faces what DVOA considers the worst run defense in the league. Todd Gurley will have to prove he is the best running back in the NFL against one of the best run defenses in the league. Melvin Gordon left last week’s Wild Card game against the Ravens with what looked like a potentially bad knee injury. However, he did return and played the rest of the game. Despite having Aaron Donald, and adding Ndamukong Suh, the Rams defense ranked 28th in DVOA rush defense. That’s good news for Ezekiel Elliott. Damien Williams has been a pleasant surprise but will have his work cut out for him against this Colts run defense. Indy does not cover pass catching backs well though and we have seen Williams play that role before. Philly shut down the Bears run game in their Wild Card matchup. Alvin Kamara is going to do his damage catches passes. The Eagles ranked 24th in DVOA vs RB receivers. 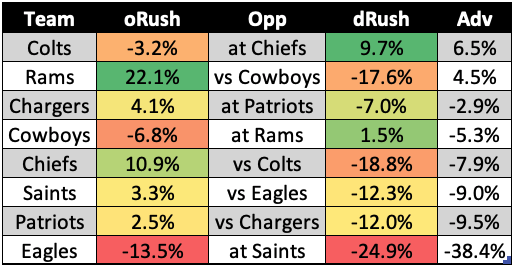 It appears as though there is finally some consistency in the Patriots rushing attack. James White and Sony Michel each see ~40% of New England’s snaps with Rex Burkhead peppered in there 25% of the time. For Fantasy and DFS purposes it’s still impossible to know who will be in for those goal line snaps. Also, the Chargers are great against the run. The Eagles backfield is easily avoidable. Wendell Smallwood (37% snaps, 10 touches) played one less snap than Darren Sproles (38%, 15 touches) in their win over the Bears with Josh Adams (1 touch) seeing 25% of snaps as well. Philly will rely on Nick Foles and their defense to beat Drew Brees and the Saints.